This April I’m joining in with the A to Z blogging challenge. Each day (apart from Sunday) I’m going to use a different letter of the alphabet to write about Monkey; her personality, hobbies and interests. T is for Thomas the Tank Engine. One thing I’ve noticed with children is that fads come and go. This is not the case with Thomas. For Monkey, Thomas isn’t just a fad. It’s a full blown obsession! I can’t really remember a time when Monkey didn’t like Thomas. It started pretty slowly and low key but by 18 months she was a huge fan. She could name all the engines, sing the theme tune, knew lots of the stories and made her own up. Her bedroom slowly became covered in Thomas posters, there was a Thomas duvet on her bed, my floor was replaced by track and engines and most outfits included Thomas somewhere. Days out started to be based around Thomas. We visited the National Railway Museum. We had lots of fun at Mattel Play in Liverpool. Apparently they have Fireman Sam and Bob the Builder there too. We never saw them! After three hours in the Thomas bit it was time to go home. We spend lots of time at the East Lancs Railway in Bury and we’ve been for a day out with Thomas there – twice! She even got to meet the Fat Controller! Our next trip has to be Thomas Land at Dayton Manor. We’ve got nothing booked yet but I’m going to find a day to make it happen. It looks amazing and she would love it there so much. Monkey gets really upset when people tell her that Thomas is for boys. It’s rare that people just outright say it but I’ve lost count of the amount of comments about having a brother we get. Most of her Thomas clothes come from the boys section which annoys rather than upsets her although she is always VERY excited if she finds Thomas clothes actually made for girls. During the Easter Holidays a huge box full of Thomas goodies arrived for her to try. She was so excited I thought she might pop. Keep an eye out for lots of reviews coming up on the blog. In the meantime you can find out more about Thomas and Friends on their website or YouTube channel. Postbox peeking is our weekly look at everything we’ve had in the post. Post is very important in this house,with me and Monkey both getting excited when it arrives. Here’s what we’ve had this week. I’ve had three penpal letters this week from Sharon, Elaine and Karen, all in the UK. Our local area has gone crazy for hidden rocks lately and Monkey has got into it in a big way. I treated her to this rock art kit and varnish to make some rocks of her own. We’ve had lots of fun with it and we’re looking forward to seeing who finds our rocks. I also bought the latest read for the Bookish Mama’s reading group that I’m part of on facebook. I’ve not read much but I’m enjoying it so far. I need to get a move on to have it finished for the end of the month though. My penpal Sharon sent me an envelope full of used stamps. I use these to raise money for Allergy UK who helped us so much when Monkey was small. We also got our Big Brekkie kit from Christian Aid. I’m not planning a huge event but I thought it would be a fun day of getting a few friends together and if we can raise some money for a great cause even better! My penpal Elaine’s lovely stationery shop has recently started offering a subscription service. Monkey is loving her letters lately so I’ve signed her up. She was very excited to receive her first package this week. She also received an invitation to join the Secret Society of Letter Writers. We’re still not exactly sure how it works but it all looks very exciting. Expect the shopping sections to be big in the next few weeks as I’ve had a few new catalogues to browse through – Next and Bravissimo. Swimming is such an important skill and one I was sure I wanted to have. We live quite close to the canal and whilst we’re not planning to go for a dip anytime soon, I’d feel happier knowing she knew what to do if she fell in. Swimming was the one activity I always knew she’d do and her lessons were booked way before she was born. Aged just eight weeks old, Monkey had her first lesson with Aquababies. She took to it straight away and loved splashing about in the water. It wasn’t too long before she had her first certificate. I was so impressed with the aquababies curriculum. I thought it would befun and would help with water confidence. I hadn’t expected her to be actually swimming so much so soon. 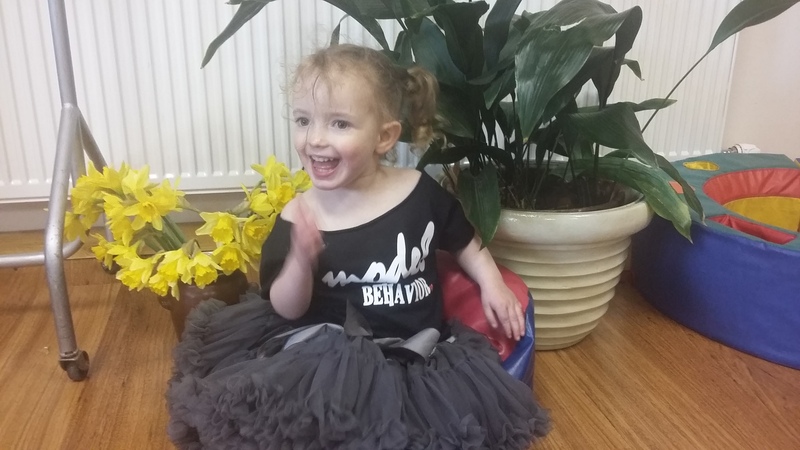 Monkey stayed with Aquababies for their Preliminary, Intermediate and Advanced courses. She can now swim 5 metres and is extremely confident at the pool. She has loved it there but when her teacher announced she was leaving we knew the time had come to move on. Five weeks ago Monkey started in her “big girl lessons” at our local pool. I wondered if she’s have a bit of a wobble as she would be getting in without me or her dad but she has been amazing. She’s just got on with it and amazed everyone with how well she’s doing. There was a bit of a debate when she started about which group to put her in. We decided on the very first group as she hasn’t done much work on her back. I think it was the right decision as the next group would have been a big step up for her. However, because of the great start she had she is flying through this stage. In just five lessons she was earnt three badges and is well on her way to the forth. She is over 50% of the way to earning her orange hat (each level wears a different coloured hat). And her confidence is through the roof. She’s in with big children, getting all these badges and being told she’s amazing. No wonder each Thursday ends with a big grin. Friday again! These weeks are just flying past. I thought this week might drag a bit as it was my first week back at work but it’s gone super quick. As always on a Friday I’m linking up over at Coffee, Work, Sleep, Repeat to share all the little things we have loved this week. I finally finished Daisy Dooley does Divorce. It’s two weeks of my life I’ll never get back as it never did get any better. I’ve started Fingers in the Sparkle Jar by Chris Packham. It’s not at all what I was expecting but I think it’s going to be a good read. I’m only twenty pages in but I’m enjoying it so far. I spent Sunday night watching my phone. I had the council website and my emails open and I was pressing refresh like a mad woman on each. I finally gave in about 4am. I made a start on 365 Days of Happy Mail. I’m trying to send something to make somebody smile through the post every day for a whole year. If you have any suggestions of people who’d like to hear from us, please get in touch. Finally the sunshine is out! It’s been so lovely this week and Monkey has been able to wear her summer clothes. All her new summer stuff is locked away for our holidays but she still has plenty. I do love a little summer dress! This is the only real news this week and the reason I was up most of Sunday night. On Monday morning we heard which school Monkey will be going to in September. I’m still not quite sure how my baby is going to school but I’m really happy because she got a place at our first choice school. She is so excited and dragged me out uniform shopping straight away. We’ve only bought bows so far as I’m desperately hoping she’ll grow into an age 2 before September. The rock hunting craze is still going strong here. I’m hoping this nice weather continues over the weekend so we can get out and about hunting and hiding. Monkey also has a party to look forward to. Monkey comes from a family of readers. Both sides of the family love a good book and it was something that we wanted for Monkey to enjoy. From the day she came home from the hospital we have read to her every single day of her life. Even from those very early days, way before she could understand what the words meant. As she got a bit older and understood more she had some favourite books and we would often find her sat “reading” them to herself. She was so young I didn’t think she’d concentrate or take anything in but as she was so adamant I did a few sounds with her. She picked the sounds up really easily but struggled to blend them into words. I wasn’t too worried. She was only two and loved books, I wanted to keep it that way without any pressure on her. So that’s what we did. We continued as we’d always done, reading books every day. Usually all three of us read stories together at bedtime and it’s a really lovely family time. If Monkey asked we’d do a bit of reading practice, but it wasn’t something I stressed about. I knew She was doing phonics at nursery too but I wasn’t sure how much or how often. And then last month she picked a reading book type book from the library. I didn’t think anything of it at the time as she always picks quite a varied selection but when we got home she announced she was going to read it to me. And she did! My three year old girl read me a whole book all by herself. I was amazed! We’d done little bits with her over the last year but had no idea she could blend. She was SO proud of herself! Since then she’s been asking to read all the time. We’ve got her lots if phonics and early readers books and she’s given them a good go. We’re enjoying a free trial of Reading Eggs and I’m amazed with how high they estimate her reading age to be. It’s a great little app and I think we’ll be buying it when the freebie runs out. But bedtime stories will always be about the cuddles! Q is for Quirky dress sense. For as long as I can remember Monkey has picked her own clothes. She has very strong opinions on what she will and won’t wear. Usually she puts an outfit together pretty well but she does have the odd day where you have to wonder what she was thinking. She usually manages to pull it off though. Here are a few of her more bonkers outfits. 5. Everything she can find – all at once! It’s not a surprise to anyone who reads this blog that me and Monkey love post. We both have penpals and really enjoy both writing and receiving letters. But for lots of people the only post they ever get is bills and junk mail. Wouldn’t it be nice to spend a year making people smile through the post. That’s just what we’re going to try to do! We’re hoping to send a piece of happy mail out every day. Ideally I’d like it to be to a different person every day. So if you’d like to hear from us please do get in touch! Each Thursday I’ll do a little update post. We’re only four days in at the moment but here goes. Tayen is a little girl we regularly write to through the Post Pals website. Post Pals is a small charity run solely by volunteers who are dedicated to making seriously ill children and their siblings smile by the sending of cards, letters, little gifts, support and friendship. Tayen is a six year old girl with neurofibromatosis. My dad (Monkey’s Grandad Tom) celebrated his 67th birthday this week so this was an easy day as we sent his cards. Ayden is another child that we regularly write to through Post Pals. He is the sibling of a child with no formal diagnosis but lots of health issues. I love that Post Pals does so much for the siblings of poorly children as this can be a very difficult time for them too. Monkey received an invitation to join this society and we had a lovely little acceptance card to send back. Don’t forget to let us know if you’d like some happy mail from us.